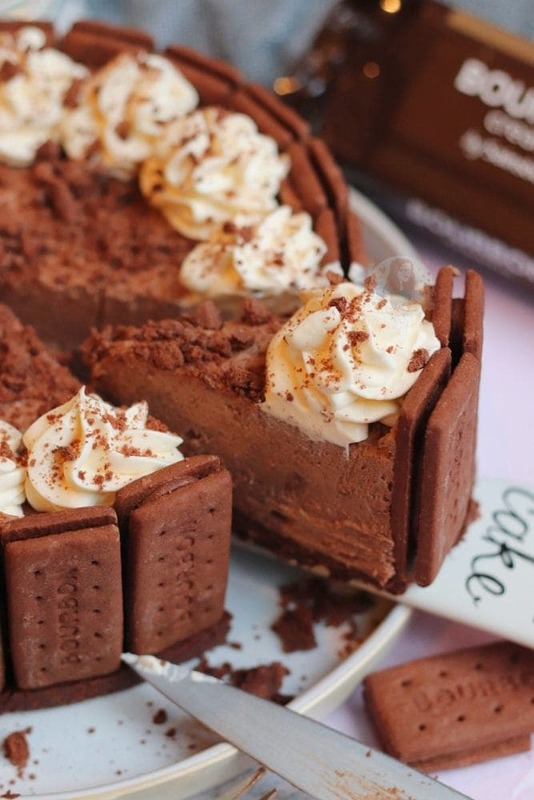 Easy No-Bake Chocolate Bourbon Biscuit Cheesecake with a Bourbon Biscuit Cheesecake Shell! Here comes, one of the most highly requested recipe in a long time. 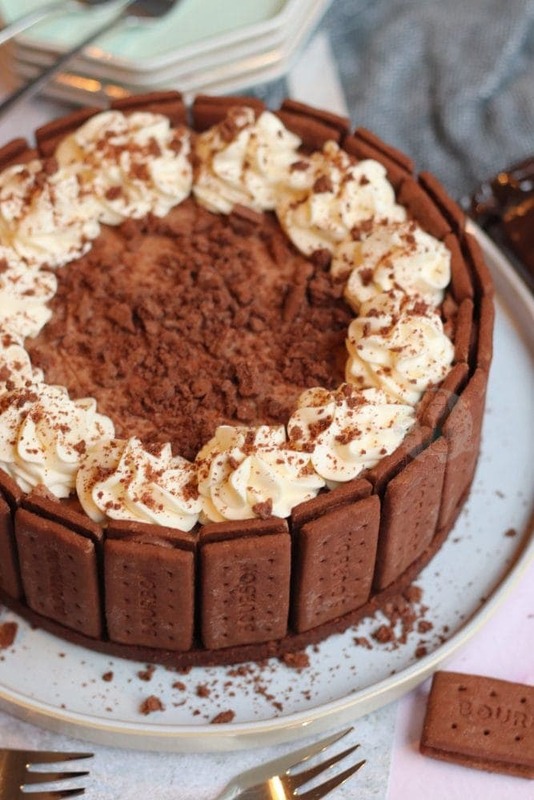 I realise I say this very often, and it’s probably in the end not THAT highly requested… but after I updated my Custard Cream Cheesecake recipe and mentioned the possibilities of using other biscuits, you all went wild for a Bourbon one. 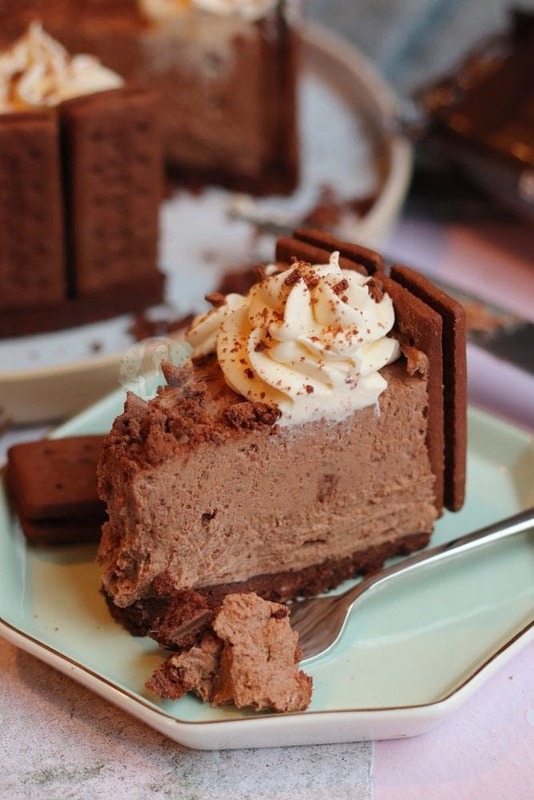 This Cheesecake, is essentially a carbon copy of my Custard Cream Cheesecake recipe, but Chocolate! 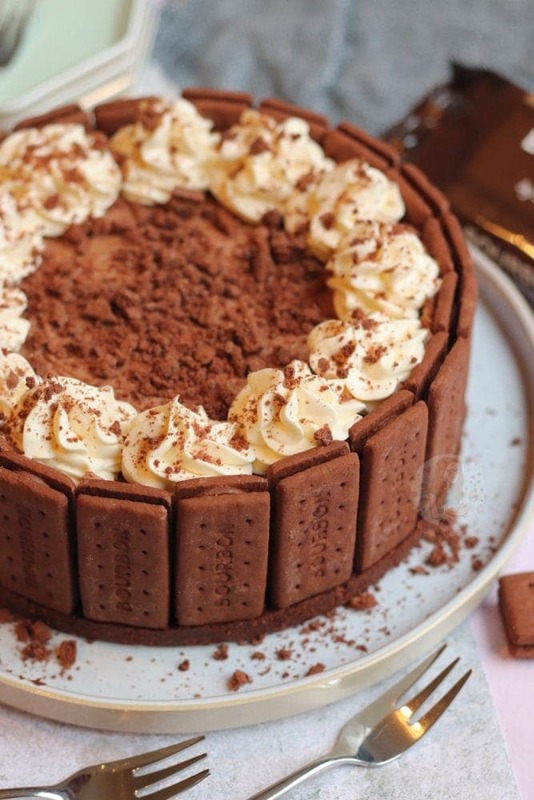 The Bourbon biscuits themselves are a classic, that you can’t really beat. Some people say that they are boring, but they are iconic! Admittedly, I’ve tried some from some supermarkets and they can taste a little odd, but in general they’re cracking. I went for the same design as the updated version of my Custard Cream Cheesecake, because it just looks so aesthetically pleasing! Literally, it’s so satisfying to be able to get the cheesecake out of the tin so easily, and then have a perfect biscuit ring on the outside. 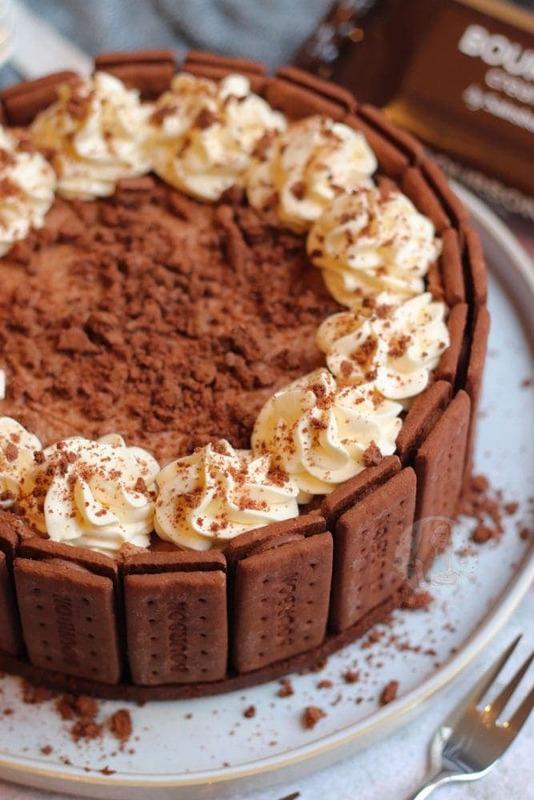 Some people say there is too much biscuit going on, but you still need a base to sit the cheesecake on! Without a substantial biscuit base (this is still thinner then most of mine), your cheesecake would probably end up in a bit of a messy situation! With the thinner base, and biscuit ring, you have the ideal. I decided for this one to use a Milk Chocolate cheesecake filling, but you can easily swap it to Dark Chocolate or White Chocolate. I think Milk Chocolate marries best with the Bourbon biscuit, but if you want it to be less sweet then Dark Chocolate is definitely the way to go. I always decorate my Cheesecakes to some degree as I want them to look fantastic in the pictures, as I am essentially ‘selling a recipe’ to everyone by the picture. If the picture isn’t attractive, people won’t want to bake it. This does mean that all the decorations are completely optional as the taste is the most important part. When I bake just for myself, and I know that I am not going to post a picture of it anywhere, then I tend to be a lot more chilled out on the decoration front. Also, for example, I have found that quite a few people don’t actually like whipped cream on its own, so tend to leave that bit off which is fair enough! I could have gone to a whole new level and put a biscuit on top of each cream swirl, but I figured that it would probably be a step too far… so settled for 1-2 biscuits crushed for crumbs. It still looks spectacular, and I definitely want to make it again and again. Blitz your Bourbon biscuits in a food processor to a fine crumb, or mash them up in a bag with the end or a rolling pin to as fine as you can get them! Mix in the melted Butter, and press into the bottom of an 8"/20cm Deep Springform Cake Tin. Chill in the fridge whilst you do the rest! 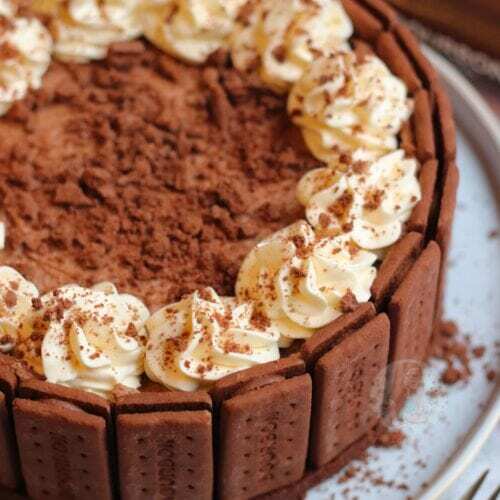 Make a ring of Bourbon biscuits around the edge of the tin, and firmly but carefully push them into the base a smidge so that they stay where they are put! Melt your Milk Chocolate carefully in a microwave or in a Bain Marie till smooth - leave to cool slightly. In a Large Bowl/Stand Mixer, add your Cream Cheese, Icing Sugar and Vanilla and whisk till smooth. Add in the melted Chocolate, and whisk till combined again! Pour in the Double Cream and whisk till thick and mousse/meringue like. 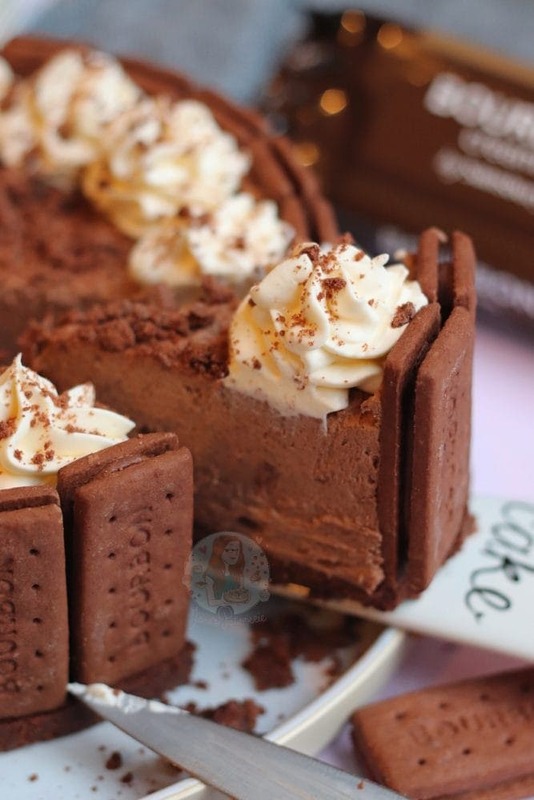 Spread over the top of the biscuit base, and inside of the biscuit ring - leave the cheesecake to set in the fridge for 5-6 hours, or preferably overnight! Remove the Cheesecake from the tin carefully! Whip together the Double Cream and Icing Sugar until thick and pipeable and pipe into your cheesecake! I decorated mine with crushed biscuit crumbs and chocolate curls! I always set my cheesecakes in the fridge overnight as the longer the better for setting! It's important to use FULL FAT Cream Cheese, and Double Cream for this recipe to make sure it works! Lower fat products don't work. 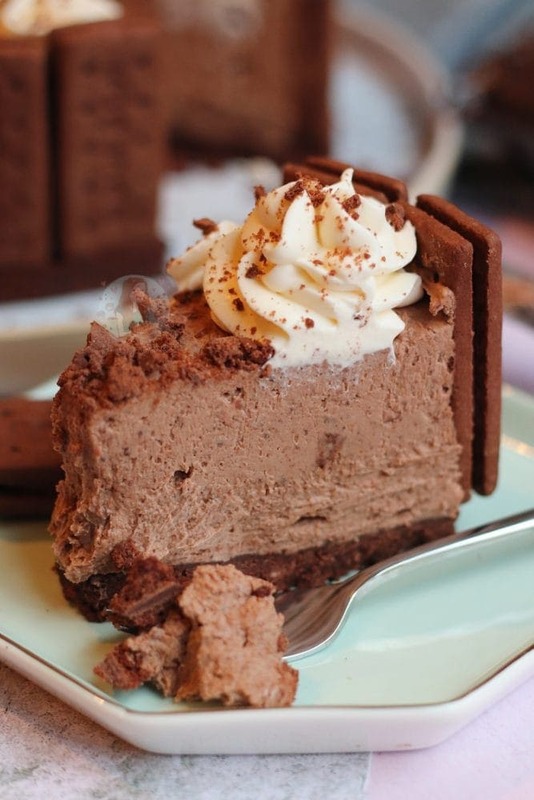 This cheesecake will last in the fridge for 3 days once made! The Biscuits around the edge of the cheesecake are optional, but delicious! 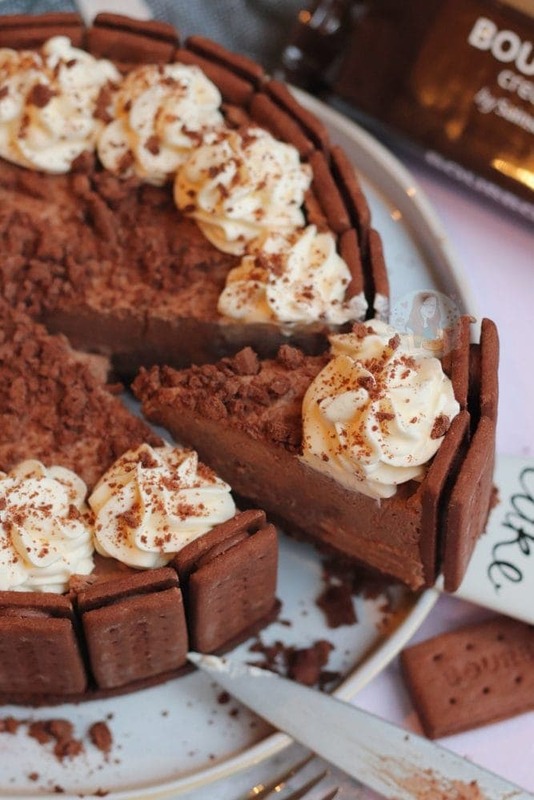 In total, I used 3 packets of Bourbon biscuits for this cheesecake! Older Next post: Lemon Drizzle Cupcakes! Newer Previous post: Vegan Biscoff Cupcakes! Hi what chocolate do you usually use?? Can I use any chocolate I like to normally eat? I would advise just supermarket own chocolate!